It looks like a lot of companies are targeting Indian mobile phone users these days. Google recently announced that it will be optimizing the web for the slow internet users in India. This optimization from Google will run on-the-fly and will be applied to almost any website that users open on a slow data connection. We tested it out and were very impressed with its results. Google achieves this by serving skeleton version of websites to the Android users on a slow data connection. But a part me of me wasn’t happy with Google removing all the bells and whistles that publishers add to their websites via custom designs. So, I wished that there was some other option which could speed up the web without compromising on the user interface. And then I heard about this Opera Max data manager app which was launched over a year ago to select testers in various regions across the world. Luckily, Opera has recently announced that it will be launching it in India very soon. Opera max is already available on Google Play but you won’t be able to download until it is officially launched in your region. However, if you are feeling adventurous then you can download it from here. 1 What Does Opera Max Bring To The Table? What Does Opera Max Bring To The Table? Opera Max passes all incoming data through its servers via a VPN connection. This compresses images, videos, and other media and results in up to 80% reduction in data usage, which results in a faster browsing experience. While this can be a life-saver on a slow 2G connection, it can also come in very handy while browsing the web on a congested WiFi connection. Opera Max allows you to customize how apps can use the internet in the background. You can either block apps from using the data connection for tracking you over the web or can simply just stop them from running in the background. This will not only result in significant battery life improvements but will also let you save up on your monthly data plan bill. The data transferred over secure connections using either web browsers or apps is not passed through Opera Max servers. This makes sure the data that you exchange over email, banking and shopping apps is untouched as you would want it to be. Watch this Opera Max promotional video and know what exactly it is in detail. We will keep you posted with more announcements regarding faster internet experience as soon as they surface. Stay tuned! 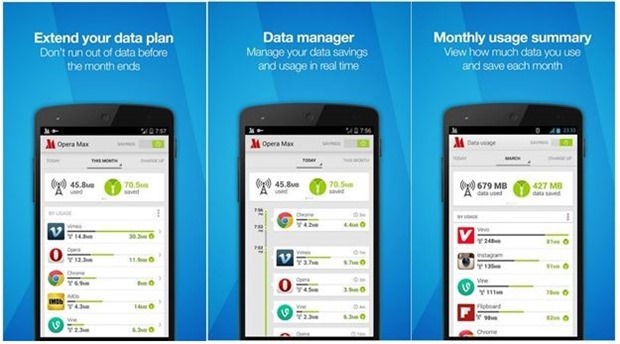 "Opera Max Data Manager App Coming To India Soon, Promises 50% Data Savings", 5 out of 5 based on 1 ratings. Great News..!, This is ultimately the best app for users who are using slow internet connection, there are many places still having only 2G and this app would be useful and provide much needed relief for browsing.